I am crazy about disposable drinkware, specifically our new mason jar. 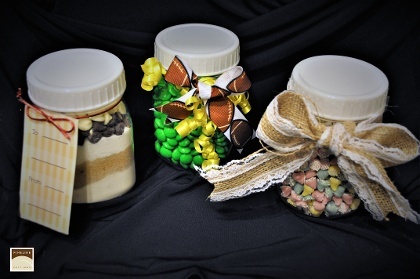 I have so many ideas for every holiday, season, event, daytime, nighttime, anytime….IT’S Mason Jar MADNESS! First, lets talk specifics it’s a 16 oz jar with 2 different style lids. 2 LIDS!!! One lid is completely closed the other has a wide opening to accommodate any size straw. Then to top it off the closed lid is completely ready for anything custom; custom sticker, custom label, custom logo. Finally, the jar itself is also completely ready for anything custom. 2 Opportunities to make the jar your own. Second, it is completely durable. Trust me I have dropped it several times while trying to create my different inventions. No cracking. No denting, no chipping. Third, let’s get our creative hat on. Of course the drink list possibilities are endless: Bloody Mary, Margaritas, Old Fashioned, ANY signature cocktail, milkshakes, “shaker” drinks (shake it right in the jar). Now for the crafty creative – how about food or gifts of a recipe? Type or write out the ingredients to your favorite treat on a recipe card; tie it around the jar neck with ribbon or stretchy chord. Or you could fill it with wedding mints and custom print the jar for weddings. Have you thought of using it for all those lil craft “pieces” or maybe use it flower vase for that country touch? Do you have kids at home – want to make a snow-globe – glue a small toy to the inside of the lid fill the jar with sparkles and water…screw the lid back on with toy inside the jar – instant custom snow-globe.